Integrity's white and blue pads and rolls soak up to 2 litres of oil on the spot. Our pink and HAZ-MAT yellow pads and rolls pick up 15 times their weight of all types of liquids on land. You'll have piece of mind because both of these products keep your work environment clean and safe. Rolls are easily cut to any size for marine or industrial use which make them good for hard-to-reach areas. Rolls protect shorelines or walkways and are useful under or around machinery. Pads (or sheets) are easy to apply when needed for fast cleanup or containment of large spills, minor spills, drips or leaks. 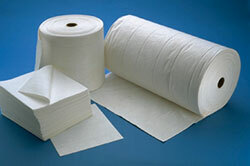 Pads also fit easily under or around machinery and are also great as a wipe to clean tools, machinery and surface areas. Integrity's yellow, pink, and grey rolls and pads immediately soak upto 15 times their own weight! The symbol for this product type is Oils - Red Circle. Integrity's white and blue rolls and pads immediately soak up upto 2 litres!